One of the biggest challenges facing employers, HR directors and trustees is how to help the three-in-four staff who are likely to miss out on a comfortable retirement. How can we understand Defined Contribution (DC) scheme member behaviours to address the lack of saving? And are there ways to encourage retirement saving and improve member outcomes? Our Guided Outcomes (GOTM) suite of solutions helps you assess, communicate and guide your scheme to a better future. DC arrangements are not delivering the outcomes needed to secure adequate retirements for the ever increasing numbers of DC savers. If staff can’t afford to retire due to under-saving, this could lead to long term workforce management issues. And pension flexibilities mean people need even more help as they approach retirement. We need a better version of DC and employers need better return on investment on their DC spend. Our GO Robo Guidance platform manages all aspects of DC, from employer insight and trustee governance to employee communication. Its unique approach actively manages individuals through how much they’ll need in retirement, progress against that target and keeping them on track in the event of a shortfall. Education and decision-making prompts are also provided in the run up to retirement. GO Robo Guidance gets individuals back on track with their retirement savings. GO empowers and encourages employees to start saving earlier. It gives more certainty to DC savers. GO analytics give trustees and employers a deep insight into likely member outcomes and behaviour. This allows them to make decisions with greater confidence, and at the same time improve scheme governance. While recognising there is a problem with DC saving, it’s hard for employers and trustees to know what interventions and communications might work. We know the status quo and blanket communications do not work. That’s why we developed GO Live. 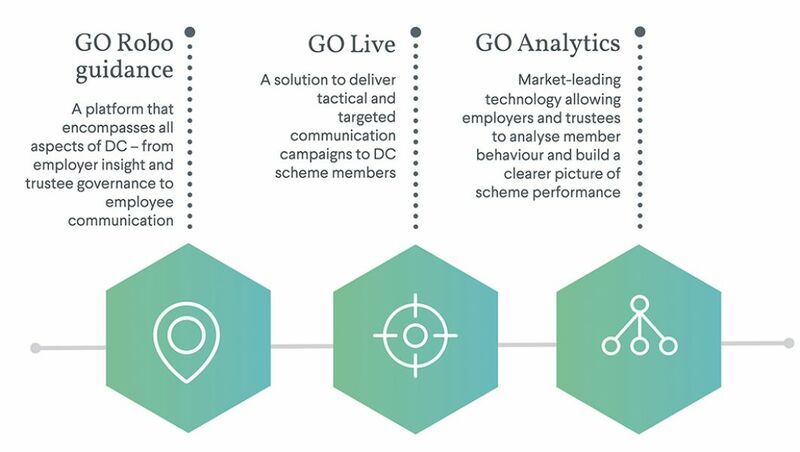 GO Live enables employers to deliver tactical and targeted communication campaigns to DC scheme members, measure the results and amend their approach for future campaigns accordingly – all to improve member outcomes. GO Live enables employers to provide targeted communications, guiding individuals to the right actions needed to secure a more comfortable retirement. Measure the effectiveness of different actions on different member populations. See what works best for different groups. Improve outcomes through delivering relevant, tailored and effective communications. It’s hard to know how many DC scheme members are likely to be on/off track from securing an adequate retirement income. Equally can they retire when they expect to and what simple interventions could help? Without a clear picture how can trustees and employers work to improve outcomes for their DC scheme members? We provide scheme assessments to answer these questions. Using our market-leading technology we analyse member behaviour and provide a clear picture of scheme performance. We use this insight to recommend solutions, and measure the impact of interventions. See at a glance how financially prepared your workforce is for retirement using sophisticated but simple to use analytics. Model different solutions to improve outcomes, before making changes. Different solutions can range from changing contribution rates, to aligning retirement ages to state pension age. You can also investigate alternative investment default strategies. Improve scheme governance by getting a clearer picture of your scheme and through making decisions based on evidence. With a significant number of their 2,500 defined contribution members likely to miss out on a comfortable retirement, ScottishPower wanted to help their people get back on track. Our simple red, amber and green ratings helped members understand their pensions more clearly. Just one month after launch, 10% had increased their contributions – and many more had decided to change their retirement age. We were really concerned that employees weren't saving enough. GO is a service provided by Hymans Robertson LLP. GO results are derived from the scheme design agreed specifically with Hymans Robertson. You should not use GO as your only source of retirement planning and should speak to a financial adviser if you are unsure about how best to save for later life and your personal circumstances. Review your pension regularly including contribution levels and investment choices, together with your attitude to investment risk and the risk you are willing and able to take, to see whether the decisions you made are still right for your current circumstances. Past performance is not necessarily a guide to future performance and investment returns may go up as well as down. The figures calculated by GO are illustrative only and not guaranteed. You may get more or less than the levels estimated. Cancellation rights apply and start within 14 days of you being notified of a change by GO to your Plan. You can opt out of GO now or any time in the future. 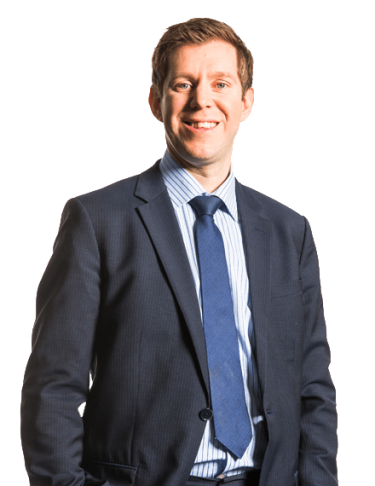 Guided Outcomes is a registered trade mark of Hymans Robertson LLP.